Facebook, Twitter, YouTube, Flickr, LinkedIn etc. Our dynamic software development methodology provides opportunities to optimize the value of a project throughout the development process. This allows our clients to position their company as an innovative market leader. A Dea Solutions IT Project Manager will acquaint themselves with your business needs, objectives and basic requirements. On the basis of this research, they will work with you to create project documentation. When the project documentation is ready, planning of the development process commences. In selecting a model of cooperation, we discuss all the terms of payment, project implementation and delivery. Dea Solutions understands the importance of usability and intuitiveness of the product. Our IT team of usability experts will ensure clear layout, intuitive usage and transparent navigation that will increase application productivity. 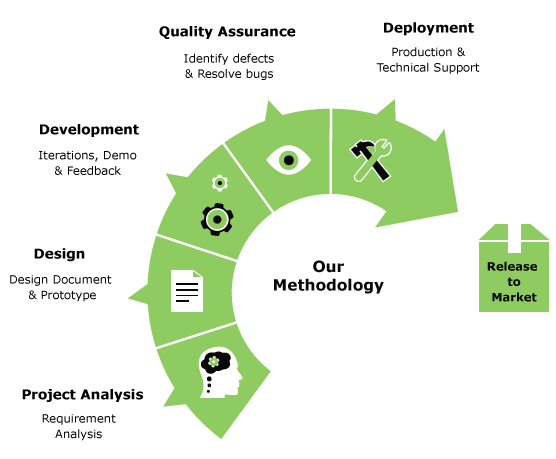 We use different Agile methodologies during the development process, allowing us to demonstrate to you your project every step of the way. This allows requirements and solutions to evolve with continuous collaboration between our team and your team. To achieve a full transparency of the development process, we provide our clients with detailed weekly reports and keep in touch via video-conferencing and IM. Teamwork is facilitated by a wide range of project management tools, including Redmine, Mantis, MS Project, Active Collab, Base Camp, JIRA and Wiki. We make sure that our clients receive timely updates on task status and progress at each step of the way.